It sounds crazy, but this Saturday 13 in the 9&10 News family jumped into a frozen lake. And it was crazy cold. 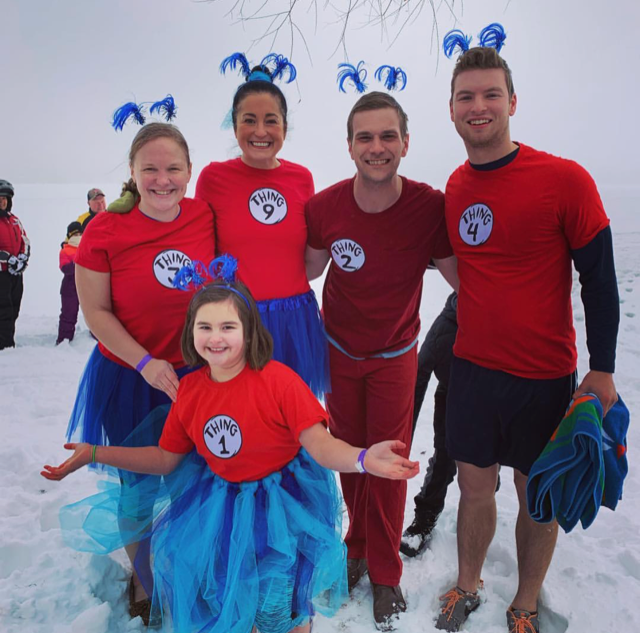 But also super great to sign up for the OASIS Polar Dip in Lake Cadillac. They are a wonderful organization that helps victims of domestic violence and their children, and we were more than happy to help raise money for them. If you want to see 9&10 members jump and freeze the first clip is of Michelle, her daughter Elle (who we think was the youngest jumper) and yours truly Executive Producer Jamie Thompson. We were channeling our inner “Thing One, Two and Three” with Charlie and one of our producers, Gary, who jumped after us. Next up, Michigan this Morning had a crew take the dip, and they did not disappoint with their creative costumes. They were the four little piggies, dunking donuts. That’s Michigan this Morning’s Adam Bartelmay, Lauren Scafidi, Stephanie Adkins and Tyler Curran taking the plunge. And last but definitely not least, the onesie crew. Whitney Amann, Haleigh Vaughn, Photojournalist Will Bly—and please keep a close eye on the Wookie. It’s our Assistant News Director Dan Firnbach. We had so much fun and are very thankful for OASIS for inviting us out to jump! And thank you to everyone who came out to cheer us on and jump with us. Even if you missed the dip, you can still donate to help OASIS operate here.